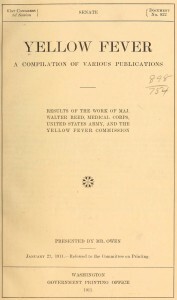 Cover of a U.S. Senate report commemorating the work of the U.S. Army Yellow Fever Commission, 1911. 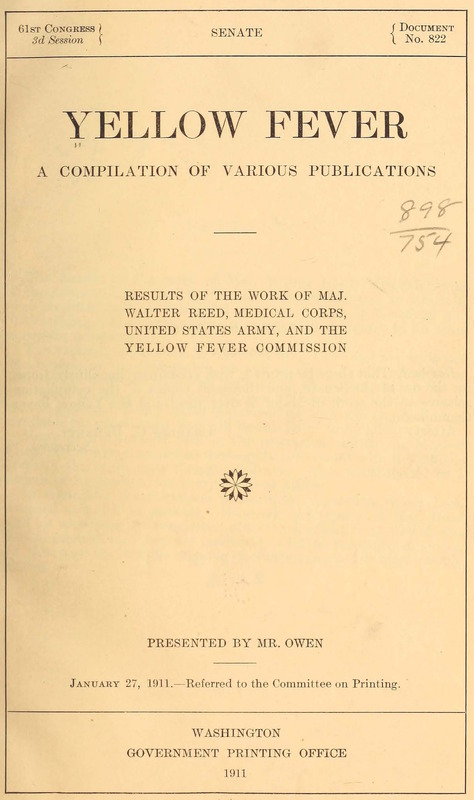 In this section of the online exhibit you can find biographies, books, websites, and other supplemental resources related to the U.S. Army Yellow Fever Commission, Walter Reed, and many individuals connected to the history of yellow fever. For questions regarding the exhibit or resources list, or for permission to reproduce any of the text or images owned by Historical Collections and Services, please contact Dan Cavanaugh, Head of Historical Collections & Services, by e-mail at dmc7be@virginia.edu; by phone 434-924-0052; by mail at The Claude Moore Health Sciences Library, University of Virginia Health System, P.O. Box 800722, Charlottesville, VA 22908-0722.